Are you planning on spending the weekend in Key West. ? If you are, come and join us on this amazing half-day cruise adventure filled with both kayaking and snorkeling. 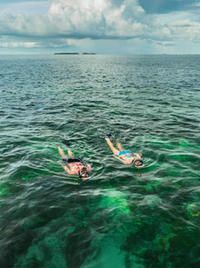 On this half-day cruise our guests will be able to experience the waters of Key West with a guided tour who will show you The National Wildlife Refuge where both activities of snorkeling and kayaking will take place. The entire adventure of the cruise will depart here in Key West from the Margaritaville Resort & Marina. As the cruise sails the staff will be sure to provided both snacks and beverages for any of our guests on board. Once arriving at the area of the activities your personal guide will provided any gear you will need, as well as sharing any particular history of the area. This entire 4 hour half-day cruise is available for booking right away online, or by simply giving us a call. We do want our guest to know that luckily we are offering this tour a couple of different times throughout the day however the sailboat only allows p21 people. After you are all booked don't forget to keep that print out confirmation, or the electronic ticket with you as you will need to show to your personal guide on your arrival in the marina. Go ahead and make the most of your key west vacation with this half-day cruise adventure. COME AND JOIN US TODAY!!! Your half-day cruise from Key West starts at the Margaritaville Resort and & Marina, Key West, where you'll hop aboard your sailboat limited to 21 people. Head out into the waters of the Key West National Wildlife Refuge, where you'll enjoy a guided kayaking tour through the mangrove habitat and go snorkeling in the clear waters of this protected environment. Your guide provides instruction for kayaking and snorkeling, plus tells you a little about the history of the area. Use of all gear is included, as well as snacks and beverages on board. Margaritaville Resort and Marina, Key West. Sailing, Snorkeling and Kayaking in the Key West National Wildlife Refuge. Light snacks provided and water, sodas, beer and wine. You will also stay out to watch the sunset.